Henry Rider Haggard was an English writer of adventure novels. He is mostly known for “King Solomon’s Mines”, “She”, “The Return of She” etc. Most of his books set out in Africa expanding a lost world in front of us. It can easily be said that he was one of the most underrated writers of his time. Those who have already read a book or two by Henry Rider Haggard may need no introduction of Allan Quatermain. So, I will keep it short. Allan Quatermain is a famous English hunter and trader. Haggard introduced him for the first time in “King Solomon’s Mines”. Despite being an Englishman, Allan liked to spend his days in Africa where he grew up under the care of his missionary father. Spreading the light of civilization in the Dark Continent is one of the things he is known for. Africans call him ‘Macumazana’ which means ‘the one who stands out’. Discreet and determined, Allan Quatermain goes out in adventures whenever he gets the chance or a friend is in danger; faces unbelievable dangers; gets himself out with his skills and cunningness and with the touch of a bit of luck. The Ivory Child is the 8th of Allan Quatermain series that has been published. The story starts in England when Allan, with a friend, visits the castle of Lord Ragnall. Eventually, they become friends. Alan meets Ragnall’s fiancé, Luna. While staying there for the night, a much stranger thing happens. Two men, named Harût and Marût and claim themselves to be the priests of a native African tribe White Kendah, visit them. He hears of The Ivory Child for the first time. Africa, two years later. Allan and Ragnall, along with much needed weapons, and their attendants, Savage and Hans, set out on a journey to the land of White Kendah, in order to rescue Luna, Ragnall’s then wife. Eliminating small dangers on the way, they arrive where the White Kendah people live. They will have to kill the big evil Elephant, Jana, which the Black Kendah people worship as an Evil god and believe to be the most powerful. On the other hand, the Ivory Child, also known as the Holy Child, tells of three curses. One of them is about an all-out war between two divided groups of deadly Kendah tribe. Can Allan protect his friends? Can he kill Jana? Who is this Ivory Child? What Luna has got to do with these? You will have to read the book to get all the answers. The novel is written in first person, described by Allan Quatermain himself. There is not much to tell about the style it is written. With the right amount of mysticism, it is a blend of love, sacrifice and friendship, a perfect storytelling and one of the best books of Allan Quatermain series. You will be sad after you finish it as well as satisfied, because it was THAT good. Since, I read the Bangla translation, my opinion will be limited to the evaluation of the translation, not the original novel. What amazed me the most was the translator’s style of selecting the words. They were easy to grab and flowing. The way he expressed every word, added a different dimension to the whole storytelling part. 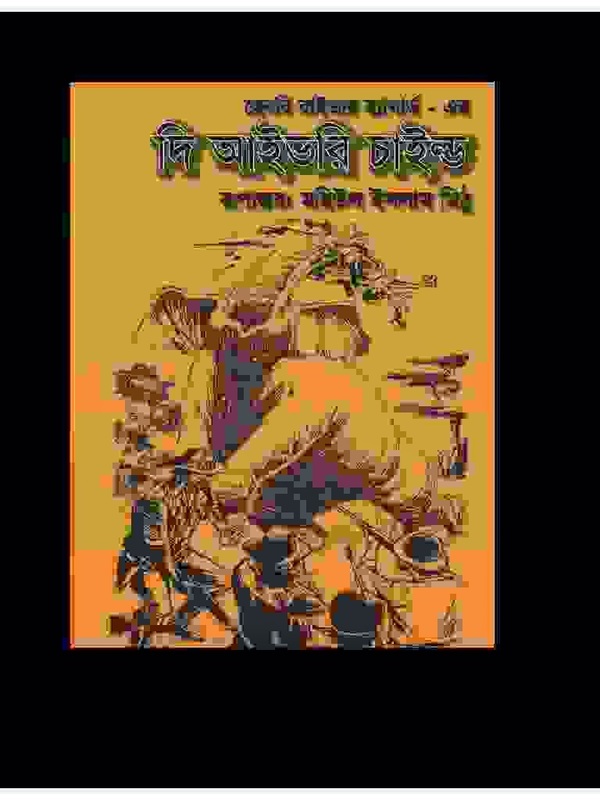 It was intended for Bangla speaking people and the translator did a good job there. I must mention, it was an abridged translation but a good one. It could be a little more detailed, especially when describing the surroundings. But as I haven’t read the original English version of the book, I can’t tell how much detailed it was. Aside from that, there are a few things I noticed such as use of English word where a Bangla word would be equally good. But this is a personal opinion (unlike me, some readers actually prefer English words sometimes). But, in some places, use of English words expressed it well than Bangla words could. Besides these small weak points (you can easily ignore them) and a few mistakes in proof-reading, it was a good translation, worthy of one’s time. I cannot but say, the cover of the book was what caught my eyes in the first time. It looks better in real than in the image. The cover, too, was done by the translator. I personally would say, “Ignore the few mistakes and you are in for a treat.